Sometimes it’s not easy to make ends meet. But thanks to the Internet, there are tons of side hustle ideas you can find online to help you earn money working from home. Whether you’re looking to make an extra money to spend on the weekend, or you’re short on cash to pay bills or rent on time, even pay off debt, you need some easy ways to make money fast. Cutting expenses can only do so much if your monthly expenses on rent, groceries, and other essentials are already high. One way to fix this is to boost your income. If you struggle to figure out what to do to earn extra money working from home, these best side hustle ideas for 2019 will help you overcome that mental block. This list of side hustles ideas includes everything you need to get started to make money fast while also working a full-time job. Best of all, you can start making money right from the comfort of your own home. That means this list doesn’t include side hustles that are not home-based like driving for Uber or Lyft, delivering stuff or performing odd jobs at people’s home or a business location. To get started, all you need is a computer and an Internet access. A side hustle is a job that you can work while also working a full-time job. It’s like a second job that earns money but is more flexible as it affords you the freedom to work on your own terms, pursue your passions, anytime, anywhere. You can do a side hustle after work, during weekends or in your spare time. It’s for anybody who has a free time on the side. Thanks to the Internet, it’s possible to do a side hustle from anywhere around the world or from the comfort of your couch or home office. According to a study by Bankrate, a whopping 37% of adults in the U.S have a side hustle. 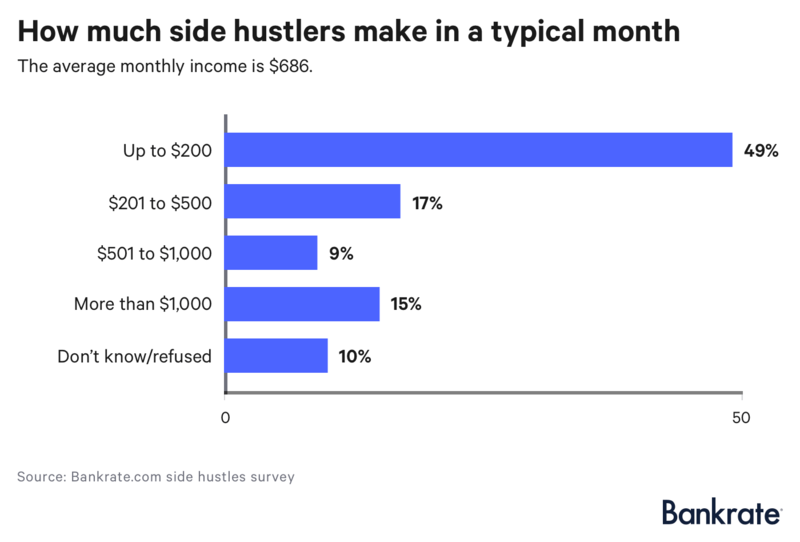 The average side hustler earns nearly $700 a month. No wonder people are jumping to get into the side hustle business. Do you want to learn how to earn income as a freelancer, even if your don’t have a business degree? Check out this class that will take your skills and monetize them as a freelancer. The best side hustle ideas are those that match your existing skill sets. For example, certain gigs like teaching English requires a good command of English. Personally, this is not a gig that I would do myself because I’m not a native English speaker. I suppose you can you tell from my writing, no? Lol. On the other hand, many other gigs don’t require you to be an expert or be skilful to start making money. Transcribing or acting as a virtual assistant, for instance, require less work background. In addition to your skill sets, passion is another thing to consider. The best side hustle is something that you can enjoy doing. For example, if you love being around animals, you might consider taking care of neighborhood pets or dog walking. It’s a great way to test the waters because you can start without a full commitment. If you find the side hustle is boring, you can always start a new one. When you decide to side hustle, is it a gig that you can do during your free time like on weekends, in the evenings or in your days off? How much time will it take to complete a job? You’ll need to make sure you can balance your time and ensure it won’t interfere with your real job. Now without further ado, here are some of the best side hustles ideas to earn money working from home. When it comes to scoring some quick wins with side hustles, taking paid online surveys should be on top of your list. Brands and companies are looking to collect data to improve their products and services. This is your chance to take part and share your opinions while getting paid to do it. Just beware that some of these so-called paid online surveys are complete scams, so you do have to choose carefully which one to take part. Avoid sites that ask for your Social Security number and never give out bank info. If the company wants you to pay them, they’re likely to be a scam. While taking online surveys won’t make you rich, sharing your opinions for a few bucks (even pennies) at a time could be worth the trade-off for people with lots of time and little money to spare. Here are some legit websites to consider that pay you to complete Internet surveys. If you are looking for a gig with no special skill and experience needed, this could be for you. Survey Junkie is an online survey company founded in 2005 with the goal of collection opinions via surveys to help companies improve their existing products or develop new ones. To participate, you do have to share some personal information such as your shopping habits, household income, gender, personal interest, gadgets you own and so on. The reason is, once they can get to know you better, they can match you with relevant surveys that pay. You earn points by answering surveys where 100 points are worth $1. To earn extra points, you can even refer friends to participate. The longer the survey the more points you’ll get (sometimes up to $50). Most surveys take between 1 to 2 minutes to complete. You can redeem your points via PayPal or gift cards once you’ve reached 1,000 points ($10). Besides taking surveys, InboxDollars rewards you for participating in other online activities such as reading emails, watching videos, playing games or shopping online. If you participate in the reading emails program, I suggest you sign up using a secondary email as this will help separate your personal email account from their promotional emails. Swagbucks is another survey site to help you make extra money in 2019. Shopping online and get cash back (includes $5 bonus). There are tons of other online survey websites. To increase your earning potential, you can sign up to as many surveys as possible – if you have time and are willing to put the work. Related: Want more paid online surveys? Check out my other post to learn about the highest paying online surveys for cash. Do you know you can start a blog like this one for as little as $3.95 per month? Starting a blog is one of those side hustles that could actually make you rich. It’s not unheard of people who make up to $60K per month, one year after starting their blog. Blogging could open up doors to other online money making opportunities which you would have never encountered otherwise. Truth be told, to create a blog successful faster, you’d probably need to dedicate more time to blogging than you would have with any other side hustles. You’re playing a long-term game here. However, the best thing about blogging is that once the income starts to kick in, it will be more or less consistent and reliable. If done correctly, you can expect to earn a few hundred dollars monthly from your blog in less than a year. The amount tends to increase over time. When I started AbsolutelyFreebies.com in November 2018, I earned $17.34 in my first month. That’s more than enough to cover my hosting expenses. I launched with just one post and wrote one or two posts per week thereafter. 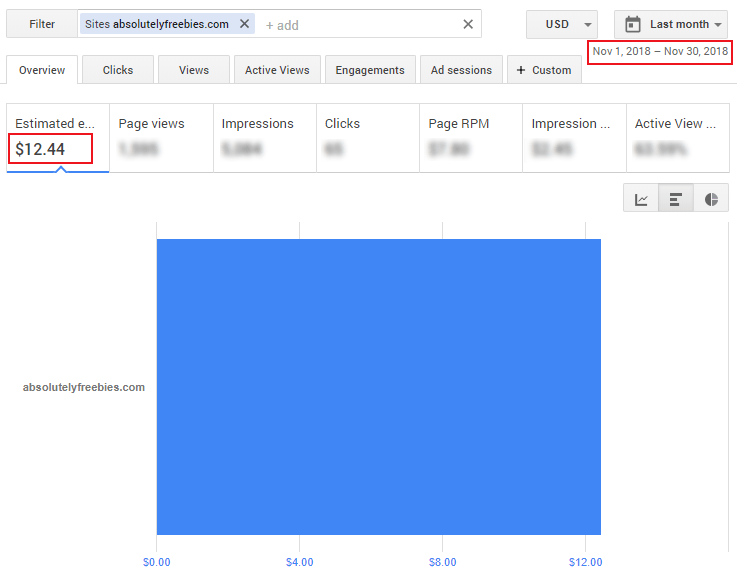 From the total, I’ve made $12.44 from Google AdSense ads and the rest is from affiliate offers. Here’s my AdSense income screenshot. I know it’s not much but still, it’s a passive income that I didn’t have before. In addition, I’ve made $3.40 promoting offers from Panthera Interactive affiliate network and $1.5 from another survey affiliate. You can sign up with Panthera Interactive here and Survey Junkie here. Granted, this is an old domain but it was no longer generating any income and getting traffic so I decided to revive it rather than letting the domain expires. As it turns out, I managed to generate some income from the get-go in my very first month when I earned $0 income in the previous month from it! I don’t blame you if you are a little curious how this is possible. I would be too. How did I do it? How did I get traffic so fast? Well, the answer is Pinterest! I was actually a little surprised by how things were progressing. Although I believe this didn’t happen by accident as I’ve put a lot of effort into this. Within one month, I went from 0 Pinterest views to around 18,000. I created my Pinterest account on the 2nd of November 2018 so I had 0 followers to begin with. Views is one thing (it’s the number of people who saw the pins that I pinned), the actual number of visitors who clicked on my pins and landed on my blog is quite another. It is actually lower. Just to be clear, I didn’t get 18,000 visits to my blog in one month, how I wish! There’s actually one tool that’s instrumental to my progress and that tool is Tailwind. Tailwind is a social media scheduling tool for Pinterest. Again I will write more about using Tailwind in my future posts. In the meantime, you can register with Tailwind for free here. Go ahead! In any case, if you want to learn more about how I do this, feel free to bookmark my blog, or follow me on Pinterest and Facebook. I will share more of my blogging and Pinterest strategies in my future posts. I will probably publish a monthly blog income report here. If you want to learn more how to start a blog, check out this post. Fiverr is an online freelance services marketplace that you can deliver online. It’s like the “Amazon for digital services” and one of the major players in the ever-growing gig economy. A service offered on Fiverr is called a Gig. You can sign up as a Seller (freelancer) and market your gigs to buyers. Although gigs start out at $5, some Fiverr sellers are generating six figures income per year. You can sell just about anything you can think of from graphic design, writing and translation, video, digital marketing, song lyrics writing, funny videos and more – as long as it’s not an illegal side hustle! The best thing about Fiverr is that they do all the hard work attracting buyers to the website and you just have to offer a better quality gig than the next seller to attract clients. If you have any particular skills set such as writing or graphic design, you can start offering those types of services. You can also use Fiverr to develop new skills along the way, learn how to deal with customers, market your brand and determine your pricing. This experience can be truly rewarding and maybe you can transfer the knowledge to other jobs besides your side hustle. No skills? No problem, if you consider yourself funny, you can do funny video and sell those services. You can sell funny video sketches, sing happy birthday while wearing a funny costume, write a message in beach sand at sunrise or anything else that you might find enjoyable. I’ve been a buyer at Fiverr since 2012. In April 2018, I decided to become a seller. I didn’t make a killing from it but getting $406.40 for 4 hours of work per month in my spare time is better than nothing. Sign up free with Fiverr today and see what you can offer. If you are a strong writer or editor, you could look for freelance writing or editing jobs. Freelance writing is one of the best side hustles that you can do from home in your own time. Fiverr is a good starting point to start your writing side hustle. Even if you don’t consider your writing skill the best in the world, you can still compete with other sellers on price as there are people who are always looking for a cheap writing service. Chances are, you’re probably not the worst writer on that platform. With a more decent writing skill, try offering your writing services at websites like Upwork. Upwork can be competitive though and you do need to know how to send out good pitches to various clients. To stand out more, you would want to create a writing portfolio to showcase your work. Creating a WordPress blog with your own domain name would be ideal. With a blog, you can attract your own clients, establish yourself as an authority and gain organic visitors daily from Google – for free. Textbroker is another site that pays you to write articles. 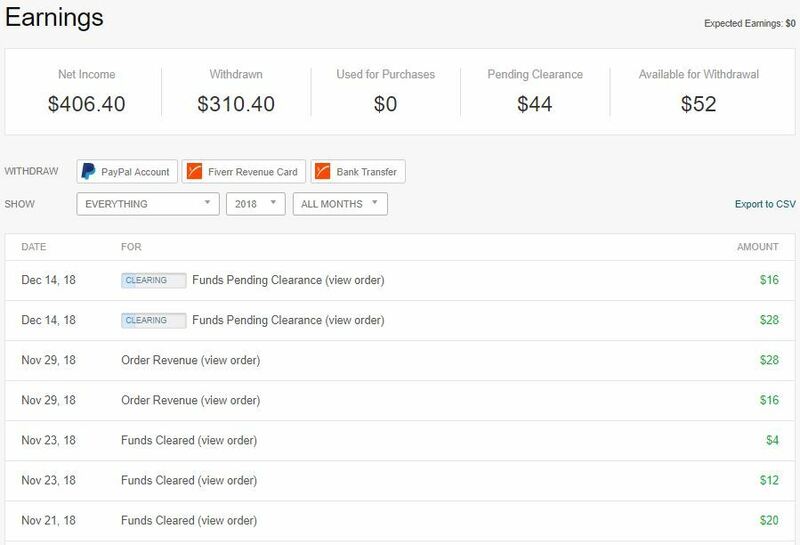 Textbrokers pays every single week and you can cash out when you reached $10 balance in your account. The average freelance writer earns between $10 to $60 per hour or more. If you’ve a special talent for spotting grammar and spelling mistakes and a relatively fast reader, you can be a freelance proofreader. With the proliferation of online blogs, there are many bloggers and authors who need proofreaders to make sure their writing is on point. I am going to mention Fiverr often in this article because it’s a site anyone can get started easily doing freelancing side hustle. Upwork and Freelancer also list proofreading jobs. These tasks can be anything from answering surveys, article writing, data entry, transcribing audio/video, excel spreadsheet work, YouTube video rating to doing basic research. Some higher paying tasks may require you to complete a number of tasks before you apply for them. It’s not unheard of someone is earning up to $100-$300 per week. Most gigs don’t pay much though but they can be completed rather quickly. So it is still a nice idea for a side hustle with flexible working hours and opportunity to work from home. You can read and ask other people about their experience side hustling with MTurk at this subreddit. Whether you’re a teacher, have a Bachelor’s degree, or just someone who has a good command of English, teaching English is one of the side hustle ideas you can consider. If you have a few hours a week to spare, you could teach English as a second language to students online. Each platform has different requirements and some require a couple of hours per week commitment like QKids. Others like VIPKid hires home-based ESL or English as Secondary Language teachers for Chinese children. They accept applicants from anywhere around the world as long as you have a stable Internet connection. You can also set your own schedule with no hourly requirements per week. Teaching online is not limited to English, you can be an online tutor in any other language that you’re well-versed enough. In addition, you can tutor in your favorite subjects like Math, Science and others with Cheqq Tutors and Tutor.com. According to ZipRecruiter, online English teachers can earn between $9.86 to $28.37 with an average of $19 per hour, the same as the national average hourly salary. Being a virtual assistant (VA) is a side hustle you can consider if you’re not into teaching, writing or graphic design and the other standard online gigs. Since most business owners could use some help with their business, being a virtual assistant is one of the top side hustles with a high demand for it. You can spend as little as a few hours per week doing administrative tasks or dedicate more time depending on the requirements. For online virtual assistant jobs, you can check CloudPeeps, Upwork and Fiverr. To find more virtual assistant job opportunities, you can participate in relevant Facebook groups where business owners and bloggers hang out and let them know about your services. On average, you could make between $15 to $75 per hour. Transcribing involves listening to an audio recording, podcast content or watching a video and typing the contents up into a written text. As a transcriptionist, you need to be a good listener and can type quickly. If that’s you, then this is one of the side hustle ideas you can make money working from home. It’s also a good side hustle if you’re just getting started because transcription jobs don’t require any experience and nearly anyone can do it. As you gain more experience at transcribing, you should be able to make more money per hour. According to PayScale, you could make between $9.82 to $25.55 per hour. Who would have thought you could get paid for cleaning your own house? If you have extra electronics laying around, CDs and DVDs, Blu-rays, books, refurbished phones, game consoles you can sell them for cold hard cash through DeCluttr. For used clothing and accessories, you can try the smartphone app Poshmark. It’s very similar to eBay or Craigslist but they put emphasis on social media and being mobile friendly. For other second-hand stuff, anything from electronics, cars and collectables to clothing, furniture and home decor, you can try LetGo. LetGo made most of their money from advertising revenue so their strategy is to attract millions of users and then sell advertising space to support their business. Rather than throwing away stuff you no longer use or let them take up space in your home, why not turn them to cash? If you love this side hustle idea but run out of your own pre-loved items to sell, go to your local second-hand shops, garage sales and thrift stores to find more stuff to sell online. Perhaps you have always been good with animals. You might consider dog walking or taking care of neighborhood pets as a side hustle idea. As a dog walker, you’ll also have a chance to spend time outdoors and exercise while getting paid to do it! You can give Rover a try which pays you for walking and sitting dogs. Alternatively, you can try Wag. To qualify as a dog walker with Wag, you’ll need to have prior experience with dogs and at least three personal recommendations. You’ll also need to pass a variety of tests, including a harness/collar test and a situational test. Additionally, you’ll have to pass a background check. The amount of money you make per walk varies based on location and walk length. On average, a walker will make $12 + tip for a 30-minute walk. Etsy is an online marketplace where you can sell craft, artwork, handmade items and vintage items. You can join and start a shop on Etsy for free. Selling craft on Etsy is one of the best side hustle ideas for moms who can sew or make special crafts. If you are a creative person or have a hobby designing and creating beautiful and unique stuff, you could potentially make decent side income from this. This is a side hustle idea for those who have a spare room, apartment, house, loft, even a camping area in their backyard and want to make money from it. The bottom line is as long as you have a space for rent, you can probably list it on Airbnb and earn easy money while working from home. There are many benefits to choosing Airbnb as a side hustle. Instead of trading time for money like the other side hustle gigs, you exchange extra space for money. Airbnb attracts traffic to their website so you don’t have to spend money marketing your listing. Of course, your listing has to be of good quality with nice pictures to draw the crowd. Since the service is review-based, the more hospitable, timely and value you offer to your guests, the better you’ll do on this platform. To avoid any problems or potential scams, you’ll get paid 24 hours after a guest checks in. Also, Airbnb will deduct 3% from your earnings as a service charge which is not bad. On average, you could make around $500 per month. This is one of the best passive side hustles to consider as the earning possibilities are endless. It has very little time commitment while giving you the opportunity to meet people from all over the world and make new friends. Register with Airbnb today and see how much you can make. For other options to rent out your space, you can also check out HomeAway.com. Do you have a car just parked outside or in the garage that you’re not using a lot? If you do, you may want to consider listing it for rent on Turo and make money renting out your car. Turo is a car-sharing company that allows private car owners to rent out their vehicles via an online and mobile interface. It’s like the Airbnb for cars. Once registered, you’ll need to describe your vehicle and upload images. Turo has guidelines for pricing, but it’s really up to you to set your own rates. You’ll want to keep your calendar up to date and be responsive to any requests. Turo also covers your car with $1 million in liability insurance and 24/7 roadside assistance throughout the trip. There are people out there who own multiple cars and just rent them out on Turo turning it into a full-time side hustle business for them. Alternatively, you can list your car, truck, van, Tesla, SUV, snow car at Getaround. You could make $500 per month on average by renting out your car. If you can rent out your room, your car why not your garage? Well, actually you can. You can actually make money renting out your unused parking space, garage, driveway and lot rather than leaving it to stays empty for hours or days. There’s a demand for parking space. Apparently, the average U.S driver spent 17 hours a year searching for parking spots. The amount of money you’ll make largely depends on your location, whether or not your spot is covered and the type of spot it is as well as the number of hours your spot is available. Some services allow owners to rent out spots for other vehicle types besides cars such as bicycles, campers and boats. If you’re looking for a passive side hustle, this one may be for you. Large city garage spaces may rent for $150 per month and up, whereas suburban spots may rent for $50–100 per month. The number one reason people do a side hustle is to make a little extra cash on the side. This can help pad their wallet and alleviate some financial stress. The best side hustle will help develop your skills and experience. It’s a great way to test the waters, especially when you’re unsure what you really want to do. It’s often a good idea not to put all your eggs in one basket though. Try to diversify your income sources, that way you’ll stand to make much more from all the side hustles combined and become less dependent on any single income source. I hope these best side hustle ideas will help you make extra money in 2019 working from the comfort of your own home!